Comic Relief - Final Total! We raised £800! What an amazing total! Huge thanks to our brilliant children and community for their support of this worthwhile charity through our school. Comic Relief helps fund good causes in this country and abroad - there's more information about the work they do here <-- Click! In total, Comic Relief managed to raise nearly £64 million. Our children had a great non-uniform day, running their own stalls which included cake sales, games, toy sales, guess the weight of the cake, and more. Children planned and resourced their stalls themselves - with help from the great people at home! 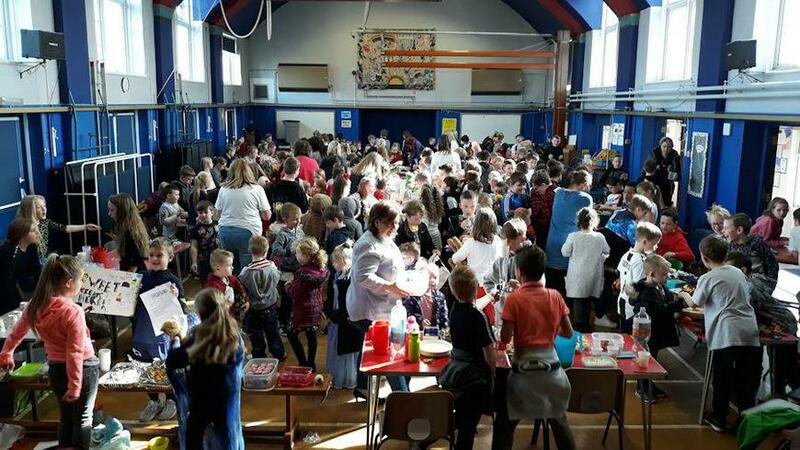 The picture below shows the event in full swing - and some children still had a few cakes left to sell to parents at the end of the school day!